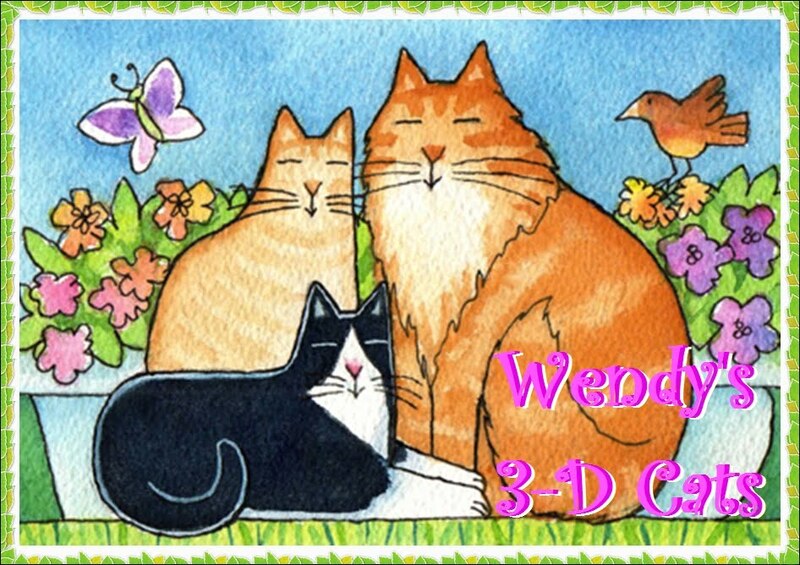 Wendy's 3-D Cats: HAPPY BIRTHDAY, DOMINO -- AND ALFIE, TOO! Today is Domino's birthday and she's wearing her brand new pink party dress that Mama gave her as a present. She's waiting for Milo to come and whisk her away across the pond to celebrate her birthday alongside Milo's brother Alfie. You see they have the very same birthday -- September 1st! So, because Milo can't be two places at the same time, Domino happily joins him in Sidmouth, England. It's just so exciting, that Domino can hardly contain herself. Here she is waiting impatiently for Milo to arrive. "Mama! Mama! Wot time is it? Wen is Milo gonna be heer?" "Calm down, Domino -- and Happy Birthday sweetie! Milo will be here very soon, but while you're waiting, why don't you model your new birthday party dress for everyone?" "OK, I will", says Domino, "as long as I kin still look out fur my Milo." What a pretty frilly dress Domino has! There are three tiers of pink tule with a white satin bodice trimmed in pink, too. The satin bow adds just that extra touch of "over-the-top"! Domino sits down to give you a better view of the back of her dress. Then suddenly a beam of sunlight comes down on Domino from the sky. "It's him! It's him! ", shouts Domino joyfully. Milo is here and Domino can't hustle quickly enough to greet him! The dress makes it a little harder to run, and she does have to PURReserve her ladylike decorum. And finally they meet! Milo's waiting on his boogie mat to whisk Domino away to the birthday party at his home in England. ... and to Alfie, too! He turns 3 years old today." To see more of the double birthday celebration, please go and see Milo, Domino, Alfie and his girlfriend Lola at "The Cat's Meow". Happy birthday, Domino! You're definitely the "belle of the ball" in that lovely dress! We hope you have a wonderful double celebration with Alfie--and of course you get to be with Milo on your b-day! Thursday: Happy birthday to beautiful Dommy. Let's go party! The LOVE-bus is waiting! Happy birthday Domino! We're just gonna collect lola, then back to our place to party! Happy Birthday Domino! I bet you'll have a great time celebrating your birthday with Alfie...and of course your special ManCat Milo! Purrs...and see you at the party! Happy Birthday to you beautiful Domino! I hope your special day is as special as you are! Happy birthday, Domino! Aren't you just perfectly pretty in your party dress! We'll head on down to bring you some birthday treats! Happy birthday sweet Domino and Alfie too! Happy Birthday Domino and many, many, many moooooore!! Have a wonderful time with Alfie in England!! Happy Birthday to dear sweet Domino from us all. Love from Milo and Alfie and our mom and dad. We love your dress!!! 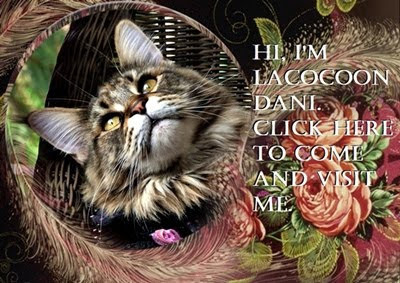 It looks purrrfectly beautiful with your furs! Happy birthday to Milo, too! Happy Birthday Domino! You look great!!! Happy Purrthday Domino! Dat sure is a purrty dress,it goes good wif da purrty lady cat wearing it. Happy birthday, Domino! I see you have some lovely plans for the day. Happy birthday, Domino !!!!! You are so cute !!!!!! Happy birthday, Domino! You look stunning in that beautiful party dress. I love how the pink just matches your delicate pink nose. Happy Birthday, Domino! You look gorgeous in your pink dress!! OMC that was so darned cute that I can't stand it! That dress was just too precious! Domino, what a lovely frock! Why, you are as beautiful as any grand flower in any garden! Hpe your Purrthday was full of fun here and across the pond with "your purrthday twin"! You look so pretty in pink Domi but you look good in everything! We love looking at the three of you! Happy Birthday to you sweetie! Happy Purrfday Domino! What a gorgeous dress you have! You have a great time in England! You look so pretty! Have a great time with Milo! 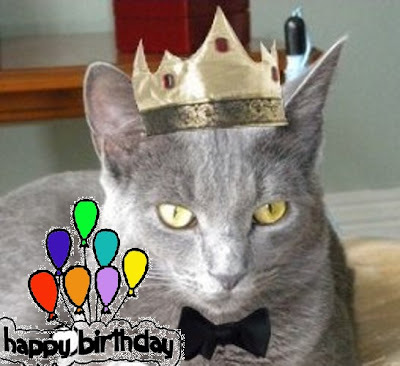 Domino, we are so sorry to be so late to wish you a VERY Happy Birthday, we KIOW you had a wonderful time, you don't have a choice in such a pretty dress! Aww, that is so sweet! We love this. Domino you are so pretty. We know you had a great time! We are so sorry we are so late. But Happy Birthday anyway!